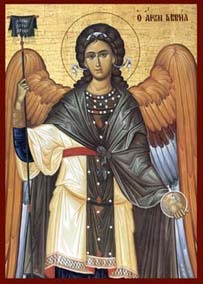 The archangel Gabriel (meaning 'Man of God') is mentioned in the Old Testament as the angel who helped Daniel understand his visions (Dan 8:15 and 9:21). In the New Testament, it was Gabriel who told Zachariah the hierarch, contrary to all hope and by God's favour, that he and his wife Elizabeth will have a son who would be the prophet of Jesus (Luke 1:11-20). Gabriel also revealed to the Virgin Mary how in her would be born Jesus, the Son of God (Luke 1:26-38). Mary's faithful response, "Behold the maidservant of the Lord! Let it be to me according to your word", makes her the highest model of obedience to God, because she chose to believe and obey Him firmly.